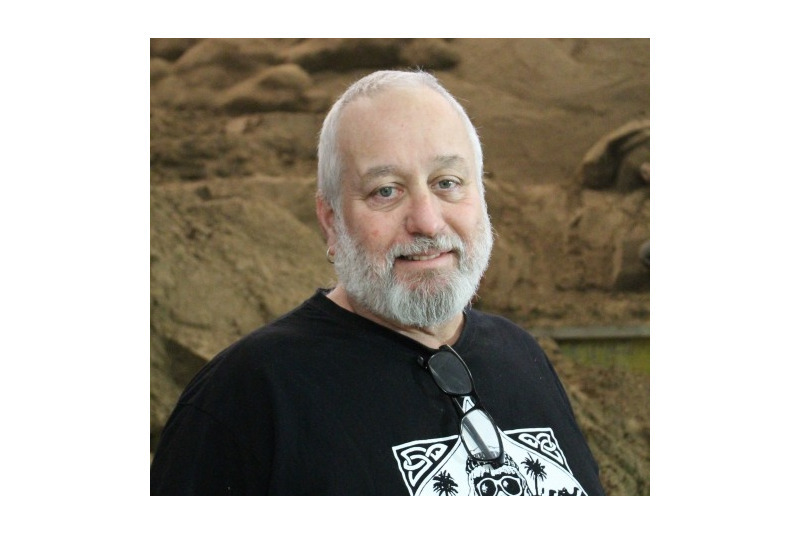 Rich Varano began sculpting sand in 1964, helping his father Frank, who at the time was an enthusiastic amateur sculptor in New Smyrna Beach, Florida, where he grew up. 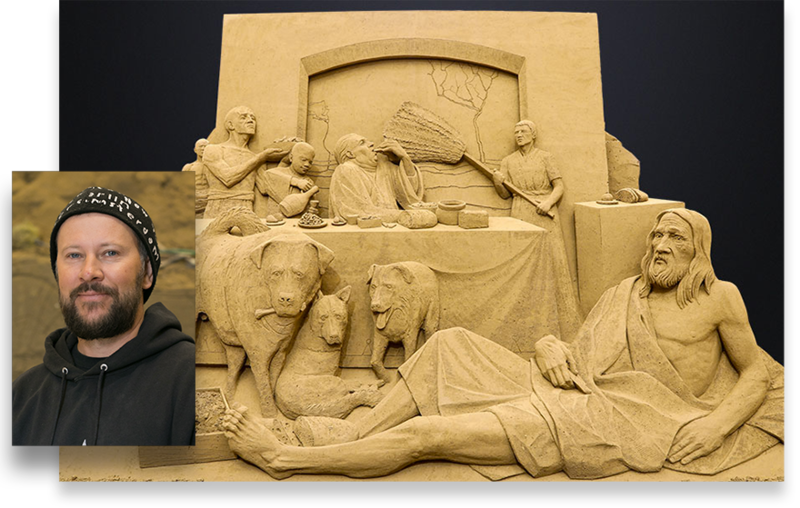 He won his first competition in 1971 and since then has established himself as one of the most successful sand sculptors worldwide. 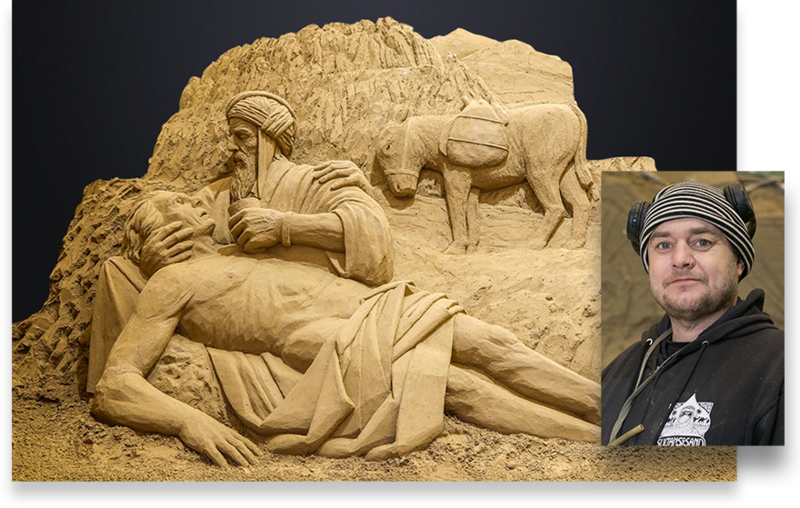 His resume comprises over 40 years of participation in exhibitions and art competitions, with 11 world titles from sand sculpting World Championships. To date, Antarctica is the only continent where he has not yet sculpted, but he is open to the possibility! 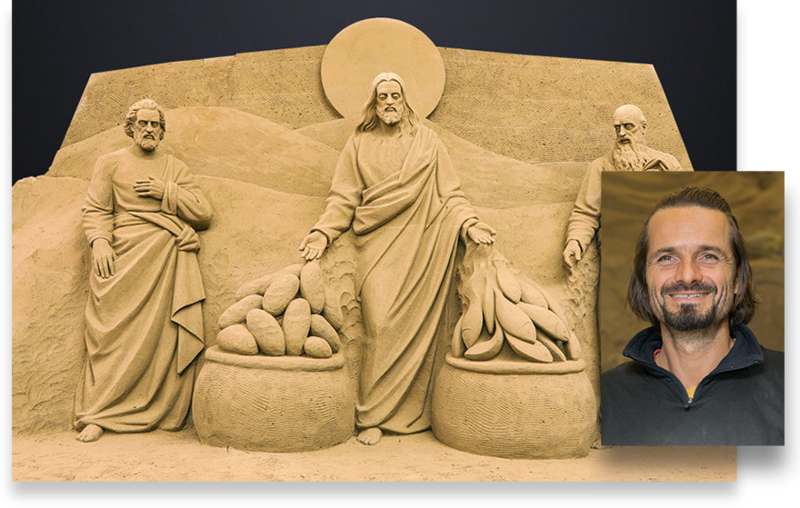 In recent years, Rich Varano has devoted himself more to organizing sculpture events around the world, including the Jesolo Sand Nativity and the International Sand Sculpture Festival in Jesolo. Andrius is a Lithuanian sculptor from the city of Palanga and a true pioneer and promoter of sand sculpture in his own country, where he has founded a permanent museum and park and organises numerous international art symposiums. He graduated in sculpture at the Academy of Fine Arts in Vilnius and, in addition to sand, he also works in wood, ice and snow. He has exhibited in solo exhibitions and won numerous competitions in Lithuania, Lapland, Finland Russia, China, Australia and the USA. 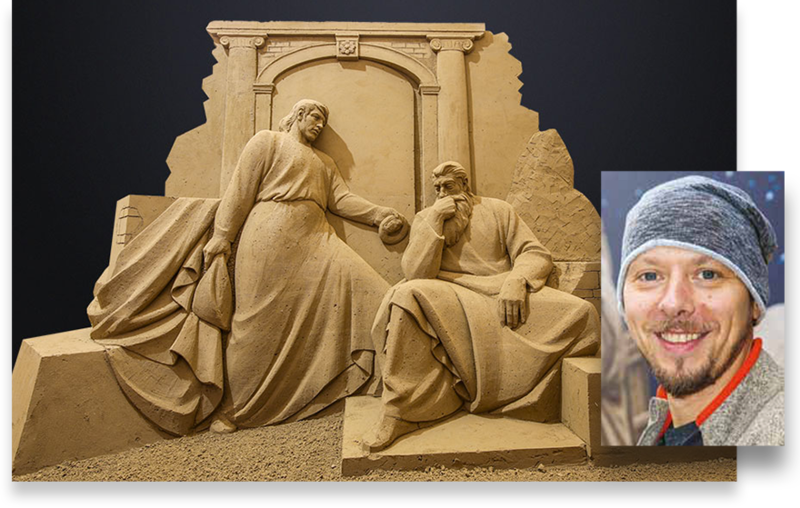 In 2014, he won first prize at the International Sandsculpting Championships in Moscow and second prize at the St. Petersburg Festival. 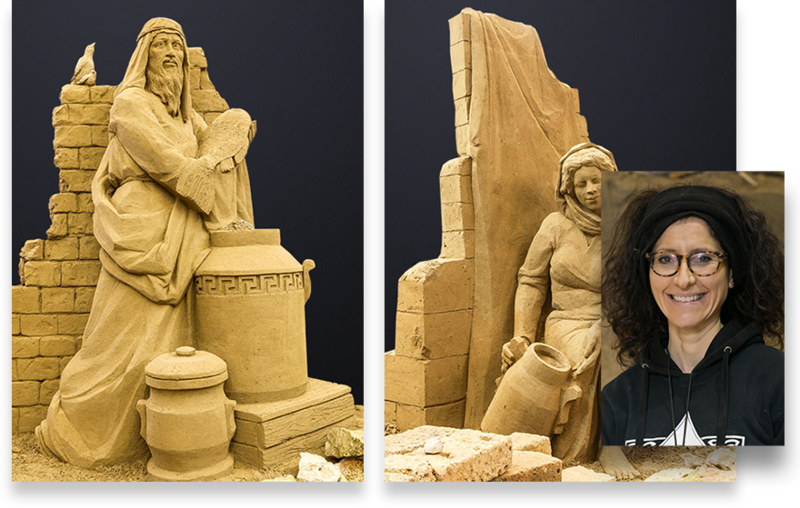 This professional sculptor, of British origin, now lives in Holland, where he began his career as a sand sculptor in 1996, founding the group Sandaholics Anonymous. He creates sculptures with the most varied materials, including snow, ice, bricks, cheese and chocolate. He has participated in the events organized in Jesolo since 2002. 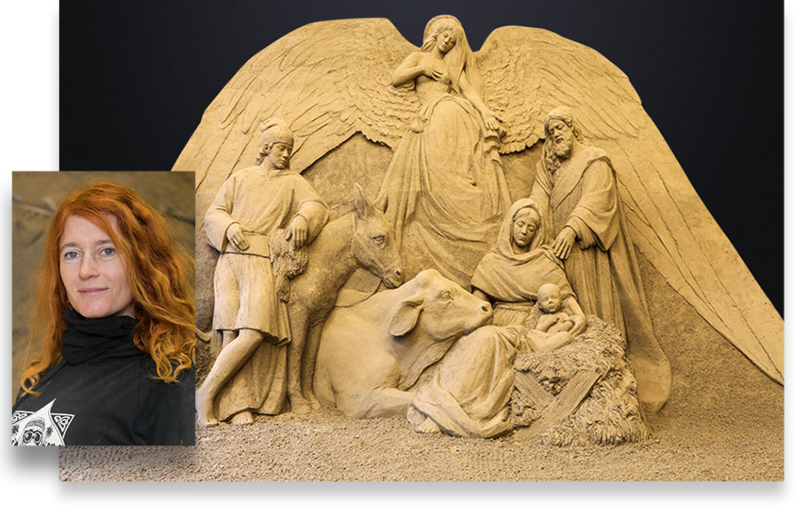 A graduate of St Joost University of Art, this Dutch sculptress is an expert at sculpting various materials, including sand, snow, ice. Her work as a professional sculptor allows her to travel the world and work as part of a team, thereby learning various sculpting techniques from other artists, in a continuous exchange of experience and skills. This artist from Kentucky works with different media and artistic techniques and his paintings have been exhibited in several individual and group exhibitions. 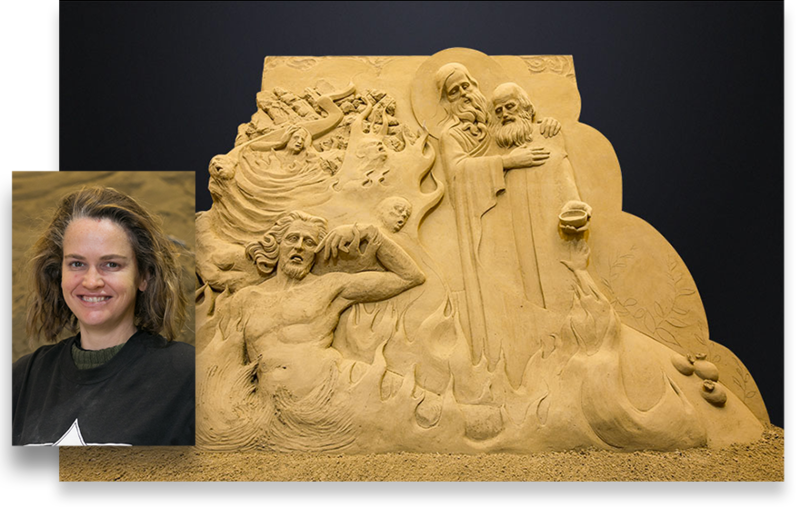 He has also worked as a theatre set designer and participated in various art projects, but is known internationally primarily as a sand sculptor. He has participated in events in Japan, America, Canada, China, Spain, Mexico and France, as well as in 30 events in Jesolo. 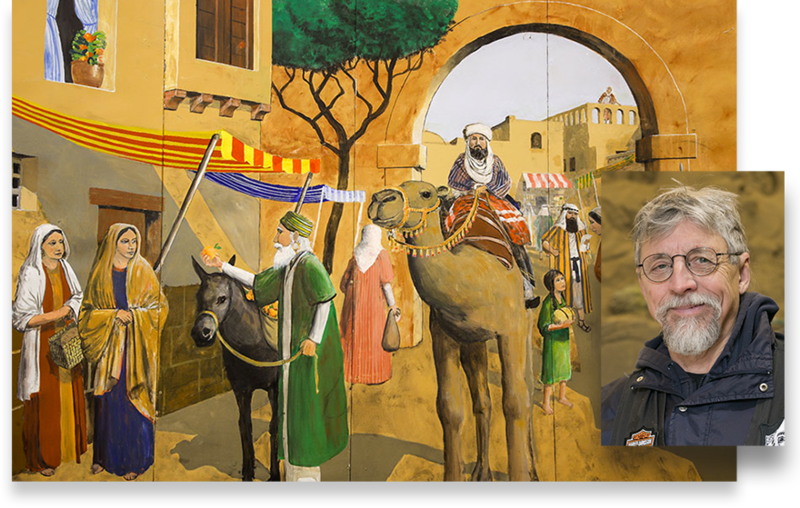 Over the last few years, he has been painting the scenic panels that accompany the Sand Nativity. The paintings were produced together with Valentina Zanetti and Elena Lana. 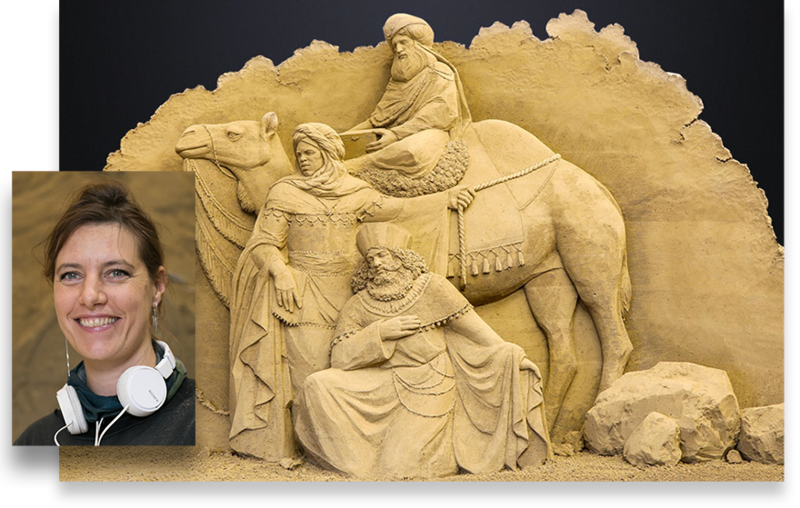 This Canadian-born sculptor began sculpting sand about 12 years ago. Working with this material has allowed him to meet many other artists and to travel the world, participating in exhibitions and competitions held each year in various countries. He is mostly a self-taught artist and has learned much from his colleagues. After studying art in Moscow, Ilya became a jewellery designer. At the same time, he also specialized in ice sculpting. 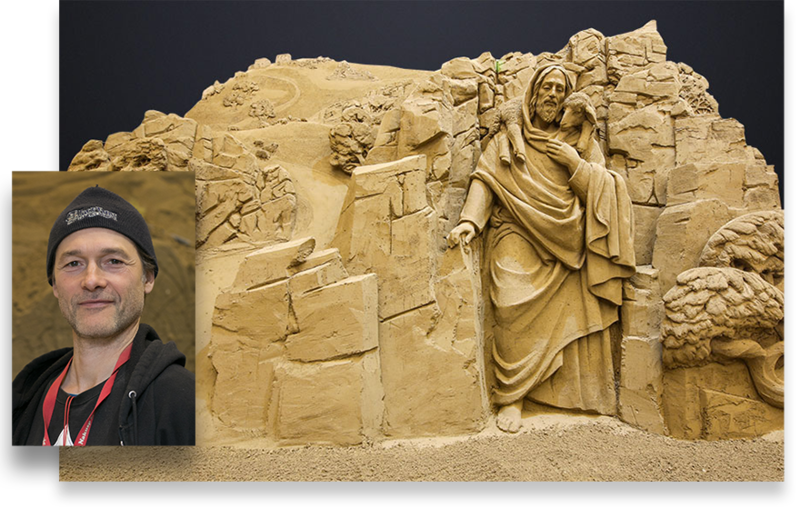 He left his work as a jeweller to devote himself to the study of sculpture at the Moscow State Academic Art Institute in Surikov and is now one of the most popular sand artists in the world. Marielle cultivated a passion for drawing, sculpture and painting from an early age, which laid the foundation for her later work as a sculptor and painter. She has always worked with various materials, but in 2006 she approached the art of sand sculpting, finding it a fascinating medium for expressing her passions and developing as an artist. Sculptor and set designer. A graduate in scenography at the Academy of Fine Arts in Bologna, she devoted herself to theatrical set design, working in opera and drama productions, experimental theatre and cinema, for which she created backdrops, pictorial decorations and sculptures in various materials. This activity led her to work in several theatres, film studios and theme parks throughout Italy. In 2004, she began to work with sand and after some experiences in Italy, she entered the international competition and festival circuit, where she has earned awards and recognition. She has subsequently tried her hand at working with other materials, such as ice and snow and vegetable carving, as well as body painting. Pedro was born in 1970 in Lisbon, where he studied sculpture and photography. His artistic career began in the early 1990s and he has since exhibited his works in various events. He has worked in silver, photography, design and sculpture, using various materials. He has also worked with other artists, sculpting and developing skills through the use of different techniques. Over the past 10 years, he has worked with sand at major festivals around the world. Born in 1973 in the Czech Republic, Radovan is a graphic designer and art teacher. 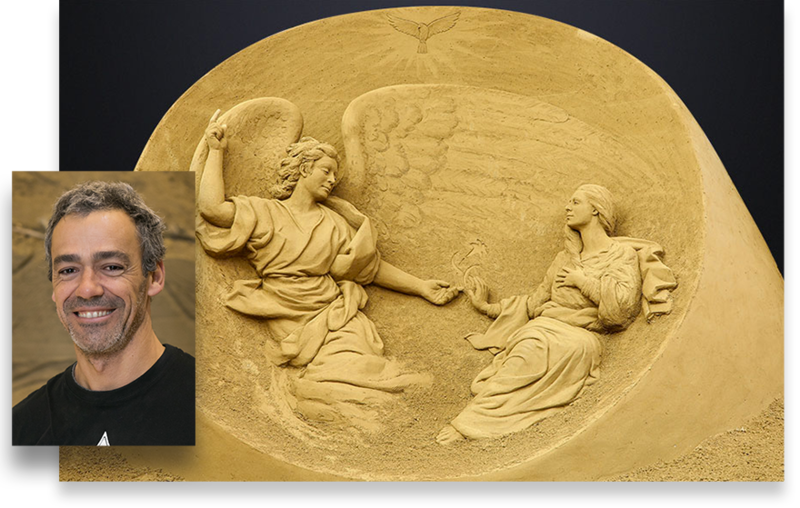 As a sculptor, he began working with the unusual medium of sand in 1997 and currently participates in the most prestigious events in this field organized throughout the world. In recent years, he has also started working with more traditional materials, such as wood, concrete and iron. He was the artistic director of the Golden Sand Festival in Bulgaria from 2010 to 2013 and director of the ArtCONFRONTO cultural association from 2012 to 2013. This Dutch artist has been working with sand since 2003, when she decided to pursue her passion for sculpture, devoting herself entirely to this art form and making it her profession. She also likes working with other materials, such as ice, snow and cement. After completing her university studies in Biology, she devoted herself full-time to sculpture, participating in projects, events and competitions around the world.